They Stopped To Help A Young Man. And It Restored My Faith In Humanity! There’s a lot -- good and bad -- that could be said about social media. But one thing I absolutely love is the fact that social media has made it possible to highlight every day random acts of kindness. Actions that would otherwise go unnoticed now take center stage and get the attention they deserve. One man recently witnessed a touching scene amidst the hustle and bustle of a packed train station. And thanks to social media, in less than two days time, his heart rendering photo of the moment is making it all over the Internet! 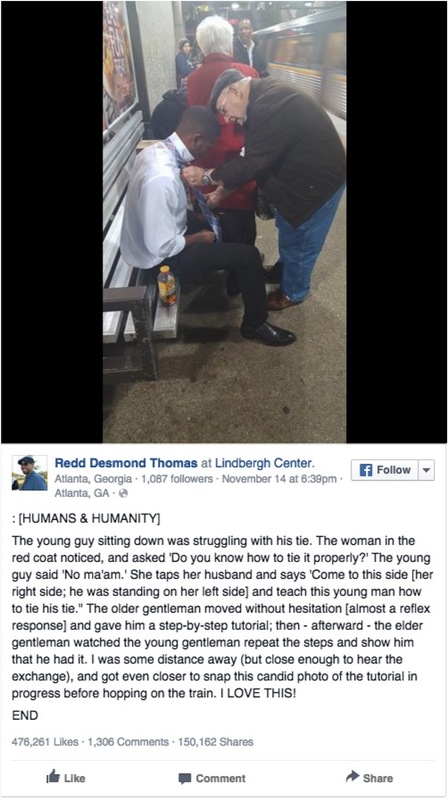 In a crowded train station in Atlanta, one young man was struggling to tie his tie. Many bustled by, but a kind elderly woman noticed and asked if the boy knew how to tie a tie. When he replied, “No ma’am,” she pulled her husband in to help. The older man patiently gave the younger man a step-by-step tutorial on how a tie is tied. He even had the young man go through the steps in front of him, to be sure he’d gotten it down. A bystander was close enough to witness the moment, and quickly snapped a photo to share on Facebook. And this simple act of kindness has been liked by 475,000 people and shared over 150,000 times. It goes to show just how much of an impact one small act can have. 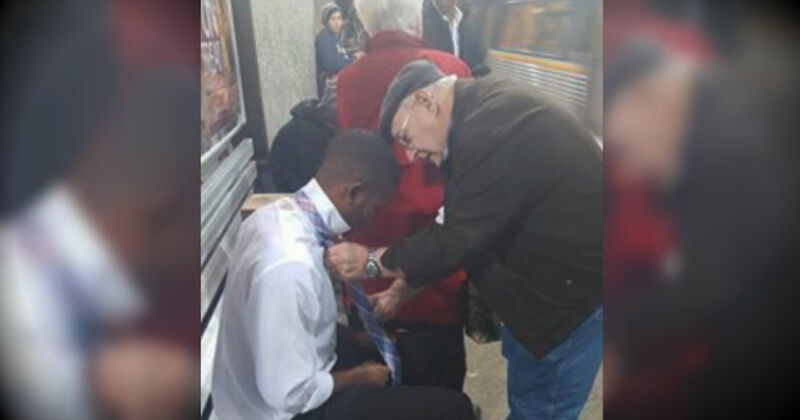 Even though we don’t know much about this young man, he clearly did not have someone in his life to teach him how to tie a tie. It was amazing to see complete strangers step in, and it’s something this young man is sure to remember for a lifetime. This type of kindness and compassion is something we can all show to each other.